The New Hampshire Fisher Cats and the Fisher Cats Foundation have named their 2013 Scholar-Athlete Scholarship winners. Ten graduates from New Hampshire high schools and two from northern Massachusetts have all earned a $2,500 scholarship based on their athletic and academic achievements in high school, and will be celebrated in an on-field ceremony prior to the Fisher Cats’ game on Thursday, July 17, against the Portland Sea Dogs at Northeast Delta Dental Stadium. The scholarship recipients were selected based upon criteria of academic excellence, athletic achievement, and active citizenship in the community. Money for the scholarships was raised through several Foundation endeavors, most notably the Granite State Baseball Dinner held annually in November. The Fisher Cats Foundation will award three special scholarships among the twelve – the Swymer Family Scholarship, offered annually to a student who has overcome a barrier and gone on to college; the Chris Carpenter Scholarship, named in honor of New Hampshire native and National League Cy Young Award Winner Chris Carpenter; and the Easter Seals Veterans Count Scholarship, presented to a New Hampshire graduate whose parent or guardian is an active, reserve, or veteran member of the United States Military. A full list of this year’s winners is below. *Tanner Nichols (Hinsdale Senior High School/Hinsdale, N.H.) – Tanner was a four sport athlete, competing in basketball, soccer, track and field, and cross country. He was also vice president of the National Honor Society, a member of the Hinsdale PTSA, and a chemistry and math tutor. Tanner will attend Rensselaer Polytechnic Institute. *Elizabeth Conway (Manchester Central High School/Manchester, N.H.) – Elizabeth was on the cross country and Nordic skiing teams. She also wrote for the school newspaper, volunteered as a track and field coach for Special Olympics, worked for Amnesty International, and tutored in math, science, history, English, Spanish, and the violin. Elizabeth will attend Brown University. *Kevin Clougherty (Somersworth High School/Somersworth, N.H.) – Kevin is the recipient of the Swymer Family Scholarship. He played football, basketball, and baseball, and will be the first member of his entire family to graduate from high school. Kevin will attend Keene State College. *Mitchell Jurius (Inter-Lakes High School/Meredith, N.H.) – Mitchell played a sport all three seasons of his high school career, being named a captain of four of those teams. He was also on the Student Athlete Leadership Committee, a member of the National Honor Society, and a Vacation Bible School teacher. Mitchell will attend Roberts Wesleyan College. *Nathan Garner (Nashua High School North/Nashua, N.H.) – Nathan is the winner of this year’s Chris Carpenter Scholarship Award. He was a member of the swim team, as well as a student columnist for the Nashua Telegraph. He was a member of the Student Senate, a volunteer swimming coach for Special Olympics, and a member of four honor societies – National, Science, Spanish, and Math. Nathan will attend Bowdoin College. *Richard Holt (Portsmouth High School/Portsmouth, N.H.) – Richard played football, basketball, and baseball, and was a member of the National Honor Society. Richard will attend the University of New Hampshire, where he will continue his football career. *Romario Bailey (Stevens High School/Claremont, N.H.) – Romario is the 2013 winner of the Easter Seals Veterans Count Scholarship. He was on the track and field, soccer, and football teams, and he was the founder of the school’s Sports Management Club and a member of the National Technical Honor Society. Romario, originally from Jamaica, will attend the University of Vermont. *Rylee Weinstein (Sunapee Senior High School/Sunapee, N.H.) – Rylee was a member of the soccer, basketball, softball, and ski teams. She was also the vice president of the Student Council and a member of the Harvard Model Congress. Rylee is undecided on her college selection. *Melissa Peart (Farmington Senior High School/Farmington, N.H.) – Melissa is the reigning New Hampshire Division III Player of the Year in volleyball, and played basketball for Farmington. She also volunteered at the Rochester food kitchen. Melissa is undecided on her college selection. *Kathareeya Tonyai (Conant High School/Jaffrey, N.H.) – Kathareeya was on the track and field and field hockey teams, and was also the vice president of the National Honor Society. Kathareeya, whose parents are from Thailand, will attend Trinity College. *Lori Merlo (Bedford High School/Bedford, Mass.) – Lori ran cross country and track, and was the founder and president of the school’s Red Cross Club. She is also a Eucharist minister and volunteered for the Miracle League of Massachusetts and the Bedford Food Pantry. Lori will attend Marist College. *Nicholas Clark (Nashoba Valley Technical High School/Groton, Mass.) – Nicholas was on the football and track and field teams, and volunteered for Homes for Out Troops. An Eagle Scout, Nicholas will attend Ithaca College. The New Hampshire Fisher Cats established the Fisher Cats Foundation to be a catalyst for the betterment of communities statewide by supporting youth programs that encourage education and promote healthy living. Through the generous support of players, employees, sponsors, and fans, the Fisher Cats Foundation continuously works to make a positive impact throughout New Hampshire and north central Massachusetts. As the primary funding source for the team’s philanthropy, the Fisher Cats Foundation supports a wide variety of non-profit organizations and coordinates several fundraising programs and events. Since its inception in 2006, the Foundation and the Fisher Cats have provided nearly $3 million in monetary and in-kind donations to over 3,500 non-profit organizations. The Fisher Cats return to Northeast Delta Dental Stadium on Friday, June 1, for a weekend series with the Binghamton Mets (New York Mets). The series features two fireworks shows and a Johnny Pesky bobblehead giveaway presented by Northeast Delta Dental on Sunday. To view the full promotional schedule and to purchase tickets, visit www.nhfishercats.com. Fans mull over memorabilia Friday, May 25 during one of two in-game silent auctions held by the Drillers at ONEOK Field to raise money for Oklahoma Tornado Relief. The Drillers raised over $10,000 and donated another $10,000 to the American Red Cross. 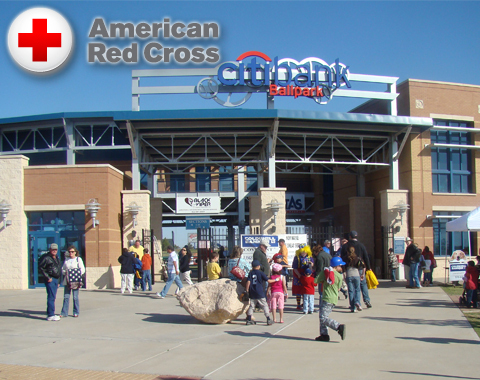 The Tulsa Drillers have announced a donation of $20,375.94 to the American Red Cross to directly benefit Oklahomans who were impacted by the recent tornadoes that struck the communities of Moore and Shawnee. The Drillers organization donated $10,000 and the remaining dollars were raised through in-stadium auctions and T-shirt sales. 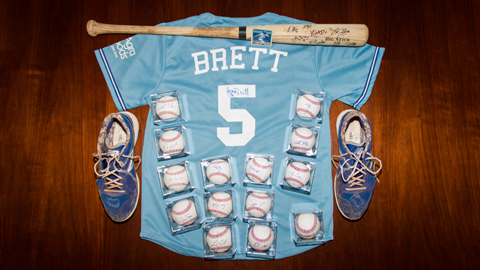 Items sold included autographs, game-used equipment and various sports memorabilia with several Drillers players, Texas League and Major League Baseball teams providing items. STOCKTON, Calif.-Before the Ports face the Inland Empire 66ers in the final game of the three-game homestand, they will participate in the third annual Challenger Little League game starting at 5:30 p.m. Participating in the game will be Challenger little leaguers from the California District 8 Little League who play on Western Little League’s field in Stockton. The game will give all Challenger participants the chance to take some swings on the field at Banner Island, as well as interact with Ports players. This article originally appeared on the official website of the Stockton Ports. Click here to view the original story. 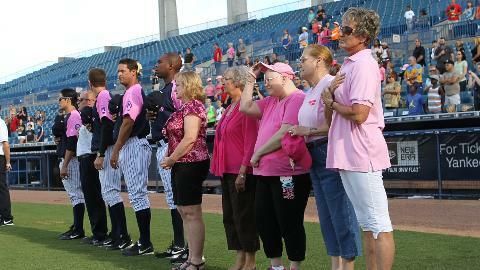 Tampa, FL – The Tampa Yankees and The Container Store teamed up for this year’s Annual Pink Out Night held on Saturday, May 4th. This event raised over $2,200 this year for the H. Lee Moffitt Cancer Research Center and Institute and has raised over $20,000 since 2007. Over 3,600 fans, the majority clad in pink attire, entered the stadium to enjoy the Tampa Yankees game and post game fireworks. Players wore pink and blue jerseys, which were auctioned off during the game. Auction winners were invited to go onto the field after the game to meet the player who wore the jersey and get it autographed. Tampa, Fla. – The Tampa Yankees and the Humane Society of Tampa Bay teamed up for the 7th Annual Bark at the Ballpark held on Saturday, May 18th. The event was sponsored by Fuzzie Buddies and Urgent Pet Care. 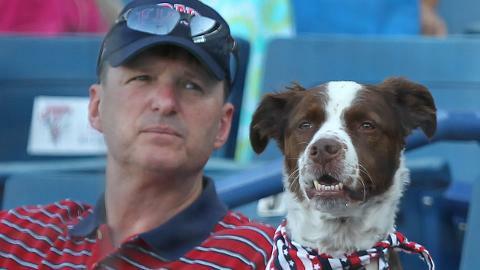 Over 125 dogs and their owners enjoyed the pre-game dog fair and then watched the Tampa Yankees win in extra innings against the Clearwater Threshers. Throughout the game, there were raffles every inning in which fans won prize packs with various types of goodies for their dogs. Tampa Bay area pet vendors were at the event promoting their local canine friendly business and to show their support of the Humane Society. Each dog to enter the stadium was required to have a “dog” ticket. This year was the first time the Tampa Yankees held a silent auction for the canine theme game worn jerseys the players and coaches were wearing. In total, the “dog” tickets, vendor donations, and jersey auctions raised over $2,800 for the Humane Society of Tampa Bay, which is the largest donation the T-Yanks have been able to make over the past seven seasons. The Tampa Yankees are the Single-A Advanced affiliate of the New York Yankees. For more information call (813) 673-3055 or visit www.tybaseball.com. This article originally appeared on the official website of the Tampa Yankees1. Click here to view the original story. Bubrick’s Complete Office & the Timber Rattlers have a great deal for teachers on Educator Appreciation Night on June 5. GRAND CHUTE, WI – Bubrick’s Complete Office and the Wisconsin Timber Rattlers are offering a complimentary ticket to area teachers as part of Educator Appreciation Night on Wednesday, June 5. 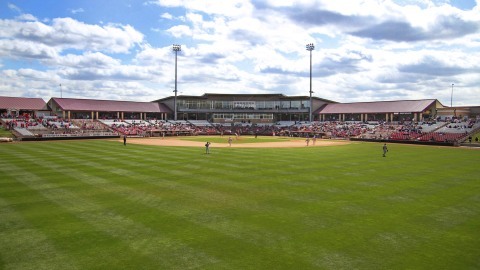 The Timber Rattlers host the Beloit Snappers at 7:05pm at Time Warner Cable Field at Fox Cities Stadium that night. Bubrick’s is also sponsoring a pre-game reception in the Leinie Lodge for all area educators. There will be snacks, drinks, gift packs, and raffle prizes. Now in its fifth year, the 2013 NYPL Scholarship Contest is open to any graduating senior from a public or private high school within the league’s footprint. Any student who has been accepted at a two or four-year college or university, vocational school, or technical education institution is eligble. Applicants will be judged based on academic performance, volunteer and extracurricular activities, and the impact their local NYPL club and Minor League Baseball have had on their lives. The scholarship contest will consist of two stages – a local round and a divisional round. In the local stage, students will apply directly to their local NYPL team, with one applicant chosen by each of the 14 teams to advance to the divisional/final round. The 14 finalists will be separated by the division of the team they represent. The winning application from each of the NYPL’s three divisions (McNamara, Pinckney and Stedler) will receive the top prize of a $2,500 scholarship. All other finalists will receive a $250 book award. 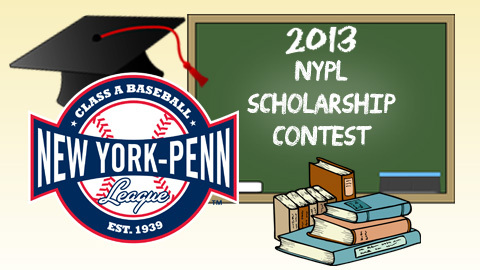 High school seniors interested in entering the 2013 Scholarship Contest can obtain the official application from their local NYPL club, or by visiting the league’s official website, New York-Penn League.com. The deadline to submit applications to the nearest NYPL team is June 28, 2013. Each club’s winner, including the three $2,500 scholarship recipients, will be selected in late July and honored at a game in August. MEMPHIS, Tenn. – The Memphis Redbirds and AutoZone have partnered to create the AutoZone Military Seating and a distinct Prisoner of War/Missing in Action (POW/MIA) black seat at AutoZone Park to honor past and present United States military servicemembers. “It is an honor to be able to recognize our military members and veterans, as well as bring awareness to the POW/MIA cause,” said AutoZone Vice President and Redbirds Foundation chairman Ray Pohlman. 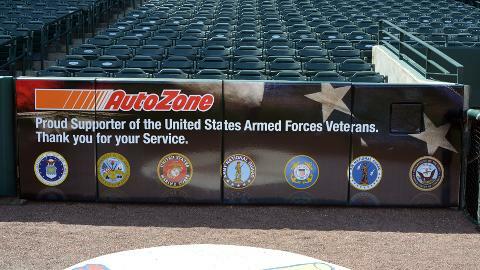 The AutoZone Military Section will contain 26 seats in the first three rows of section 106 adjacent to the Redbirds home dugout along the third base line. Seat one in row A of that section will be wrapped in black with the official POW/MIA logo on the seat with the writing “Reserved In Memoriam.” That seat will not be available for purchase and remain empty. Military personnel will receive 50% off seats located in the AutoZone Military Seating every game this season by presenting a valid military ID at the Redbirds box office. To celebrate the 70th Anniversary of the 25th and final combat mission of the World War II B-17 bomber, the Memphis Belle, the Redbirds are giving away 2,000 Memphis Belle T-shirts on Veteran’s Appreciation Night on this Saturday, May 25. Military personnel can receive discounted tickets for that night by calling (901) 722-0251. Fans can stay after the game to enjoy the first of two fireworks extravaganzas of the homestand set to music from the Big Band Era. Fans can celebrate Memorial Day and enjoy a matinee game with a ticket and buffet pack as the Redbirds take on the Round Rock Express at 1:05 p.m. on Monday, May 27 at AutoZone Park. Ticket packages are currently on sale. Please call (901) 722-0251 or visit the Redbirds website at www.memphisredbirds.com to order or for more information. About Memphis Redbirds Baseball Foundation: The Memphis Redbirds Baseball Foundation is the first and only not-for-profit charitable organization in the United States to own and operate a professional baseball franchise, the Triple-A Memphis Redbirds. AutoZone Park – the finest ballpark ever built in the United States below the Major League level – is the home of the Redbirds and has served as the cornerstone of development in downtown Memphis. Incorporating the Memphis Redbirds as not-for-profit entity allows the community to own the team and facility. For the first time in history, Mid-South residents, corporate leaders and baseball fans are able to give back to the community – and at the same time enjoy first class entertainment – by supporting Memphis Redbirds Baseball. About Global Spectrum: Global Spectrum (global-spectrum.com) manages the Memphis Redbirds, as well as more than 100 other public assembly facilities around the world. Nearly 20-million people attended more than 11,000 events in Global Spectrum venues last year. Based in Philadelphia, PA, Global Spectrum is part of Comcast-Spectacor, one of the world’s largest sports and entertainment companies. Comcast-Spectacor also owns the Philadelphia Flyers of the National Hockey League, Ovations Food Services, a food and beverage services provider, New Era Tickets, a full-service ticketing and marketing product for public assembly facilities, Paciolan, the leading provider of venue establishment ticketing, fundraising and marketing technology solutions, Front Row Marketing Services, a commercial rights sales company, and Flyers Skate Zone, a series of community ice skating rinks. This article originally appeared on the official website of the Memphis Redbirds. Click here to view the original story. (Fort Mill, SC) – The Charlotte Knights will hold the first of their three Military Appreciation games of the 2013 season on Memorial Day, Monday, May 27 at Knights Stadium. All veteran and active Military members are welcome to come out and enjoy a great night of baseball. All three Military Appreciation games are presented by Bank of America, OrthoCarolina, and Uncle Bob’s Self Storage. Gates open at 6:00 p.m. on Monday and first pitch between the Charlotte Knights and the Toledo Mud Hens (Triple-A affiliate of the Detroit Tigers) is scheduled for 7:15 p.m.
Before the game, the Knights will welcome a Military member from each of the most recent wars. All five veterans will throw out a ceremonial first pitch. The entire night will have a Military theme and fans coming out to the game are encouraged to send a photo of a loved one who has served, or is serving in the Military to Tommy Viola at tommyv@charlotteknights.com. The photos will be used in a special slideshow that will be played on the in-stadium videoboard before the first pitch of Monday’s game. As part of the Military-themed game, all Knights players will wear special Military jerseys on Monday and for all three games this season (May 27, June 29, and July 3rd). A jersey auction, which will take place online at charlotteknights.com, will run until Sunday, July 7 at 11:59 PM. Fans can bid on the game-worn, autographed jerseys right from their home computer. A portion of the proceeds will benefit the USO of NC. Tickets are on-sale now and can be purchased in person at Knights Stadium, by phone at 704-357-8071 ext. 2106, or online at http://www.charlotteknights.com. Currently, fans can purchase field box tickets to Monday’s game for just $5 by using the promo code “starsandstripes” online at charlotteknights.com. Offer ends on Sunday, May 26 at 11:59 p.m. Knights Baseball… Tradition Never Ends. Cedar Rapids, IA – The Cedar Rapids Kernels and Kernels Foundation will present Thomas Eilers as the winner of the 2013 Nick Adenhart Memorial Scholarship before the Kernels game with Peoria on Sunday, June 16th. Thomas is a 2013 graduate of Cedar Rapids Prairie HS where his school activities, academic accomplishments and baseball accomplishments were quite impressive, making him an excellent choice for the scholarship. Thomas plans on attending the University of Iowa to major in mathematics and education. Nick’s family continues to honor him with the awarding of a $1,000 scholarship in his memory. 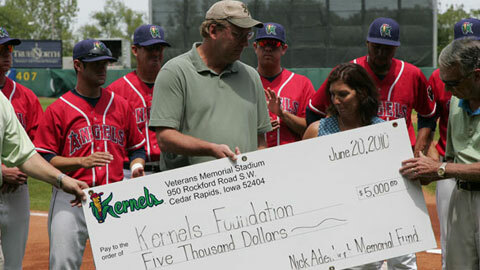 The Kernels Foundation is privileged to administer the scholarship on behalf of Nick’s family. The Kernels return to Perfect Game Field at Veterans Memorial Stadium on Saturday, May 25th to open a six game home stand with games against Burlington and Clinton. Fans can enjoy all the action with Morgan Hawk on the radio home of Kernels baseball, 1450 KMRY AM, 93.1 KMRY FM, or listen on-line at www.kmryradio.com, or www.kernels.com. This Saturday the Harrisburg Senators and their fans will step forward to do their part in helping the Oklahoma Tornado Relief Efforts. The Senators are wearing special Camouflage Jerseys which fans will have an opportunity to own through donation to the relief efforts. All proceeds from the auctions and raffle will be donated to the American Red Cross to support the Oklahoma Tornado Relief Efforts. A live auction will take place after the game with several players participating. In addition, several jerseys will be in a silent auction during the game on Saturday night and one jersey will be available in an online auction beginning Friday. The remaining jerseys will be in a raffle with fans able to purchase raffle tickets during all four games this weekend. The players will autograph their individual jersey. The raffle will take place during the game on Monday and fans winning jerseys in the raffle will be notified following the game on Monday. 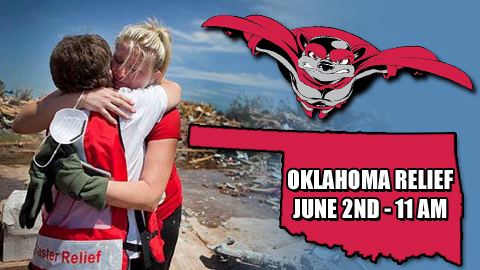 Please join the Senators in helping those in need in Oklahoma. The tornado, which struck Monday, was 1.3 miles wide, was on the ground for nearly 40 minutes, and killed 24 people in Moore, Oklahoma, a suburb of Oklahoma City. The game time on Saturday is 7:00 p.m. with the Senators taking on the Reading Fightin Phils. Tickets are available on game days 10:00 a.m. until the end of the game, and Sunday from 9:00 a.m. until the end of the game. Box office hours on non-game days are Monday through Friday, 10:00 a.m. to 5:00 p.m., and Saturday from 10:00 a.m. to 2:00 p.m. Tickets are available via telephone during the same hours as the box office hours. Tickets are also available 24 hours a day, 7 days a week, online at www.senatorsbaseball.com. Proceeds from the event will aid in sending veterans from the Michiana area to the memorial in Washington, D.C. The Honor Flight Network is a nonprofit organization, with 117 hubs across the United States, which has flown over 100,000 veterans to Washington, D.C. for more information on the non-profit visit www.honorflight.org. The Gwinnett Braves have awarded their $1,000 grant for the month of April to Gwinnett County Special Olympics. The “Take Me Out to a Ball Game” themed grant, aimed at assisting organizations that promote youth athletics and activities, will help fund Special Olympics’ sports programs for youth with intellectual disabilities. The Special Olympics program was founded in 1968 by Eunice Kennedy Shriver and provides year-round training and athletic competition for more than one million athletes in nearly 150 countries and all 50 states in the United States. Gwinnett County Special Olympics is the agency that operates the Special Olympics program in Gwinnett County. Their program supports more than 2,000 athletes of all ages including school-age children with intellectual disabilities, giving them continuing opportunities to develop physical fitness, demonstrate courage and experience joy of sports participation. The funds from the grant awarded by the Gwinnett Braves will help Gwinnett County Special Olympics in its continued mission to provide uniforms, transportation, sports facilities and equipment for youth athletes specifically in Gwinnett County. The Gwinnett Braves and Gwinnett County Special Olympics have had a strong partnership for the past five years, including an annual “Best Buddies” clinic where disabled youth learn baseball skills from G-Braves players at Coolray Field. The original story appeared on the Gwinnett Braves’ website can can be viewed by clicking here. Help ‘bag up hunger’! Donate at Fifth Third Field! 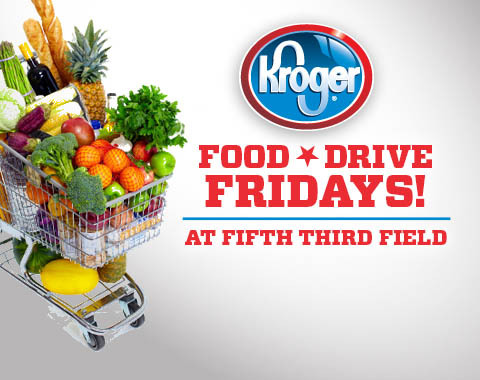 The Mud Hens and Kroger have teamed up to present Kroger Food Drive Fridays at Fifth Third Field! Bring non-perishable food donations on Friday, July 26, and Friday, August 16. Each person that donates a minimum of three items to the food drive will receive a reusable shopping bag, courtesy of Kroger! There will be collection bins at all Fifth Third Field entrances. Need tickets to the Food Drive Friday games? Call 419-725-4367 or order online. The first 2,500 fans at the Friday, July 26 game will receive a box of macaroni and are encouraged to use it as a noisemaker to cheer on the team. After the game fans can take the macaroni home for a tasty meal or donate it back to the Kroger Food Drive Friday event! Kroger will be matching the amount of boxes given away on Macaroni Day with an additional donation of 2,500 boxes! All Kroger Food Drive Friday events benefit the Northwest Ohio Food Bank. On Sunday, May 12th, Joseph P. Riley, Jr. Park became a vision in pink to help Save the Milkshakes. To celebrate Mother’s Day, and to raise awareness for Breast Cancer, the Charleston RiverDogs teamed up with a locally founded Breast Cancer Awareness nonprofit, Save the Milkshakes for the inaugural Pink in the Park event at The Joe. As a special promotion for Pink in the Park, $1 from every Beer Shake sold on Sunday May 12th was donated to Save the Milkshakes. These proceeds, along with the funds collected from selling “Save the Milkshake” t-shirts, which you can purchase for the rest of the RiverDogs season at the Pie House, located within Joseph P. Riley, Jr. Park, will go towards breast cancer research. Save the Milkshakes is a locally founded Breast Cancer Awareness Organization with the goal to help local women diagnosed with breast cancer while pregnant. Save the Milkshakes hopes to provide funding to breast cancer research while bringing together mothers that have just been diagnosed with breast cancer with those that are able to donate breast milk to newborn babies. For more information about save the Milkshakes visit http://www.savethemilkshakes.org/. The Charlotte Knights held their 6th Annual Charity Golf Classic, presented by Duke Energy, on Wednesday, May 22 at the Tega Cay Golf Club. The event was a huge success. Over 150 golfers arrived on Wednesday eager to get on the course. The weather was beautiful and the competition was fierce — and it was all for a great cause. Registration began at 8:30 a.m. and by 10:00 a.m., the golfers hit the course ready for a full day of fun in the sun. Golfers competed to win some great prizes, but the day was more about raising money for charity. Knights Community Relations Director Lindsey Roycraft did an outstanding job putting the entire event together. Wednesday’s annual golf classic was set up to help raise money for the Levine Children’s Hospital. Each year, the Knights, along with many of their great partners, hold this golf event to raise awareness and money for children and families in need. 100% of the money raised from the golf classic goes directly to Levine Children’s Hospital. After all of the golf, the players made their way back for some delicious food and the award presentation. At that time, Knights Executive Vice President, Chief Operating Officer Dan Rajkowski, along with Mark Griffith of Levine Children’s Hospital, announced the grand total raised. 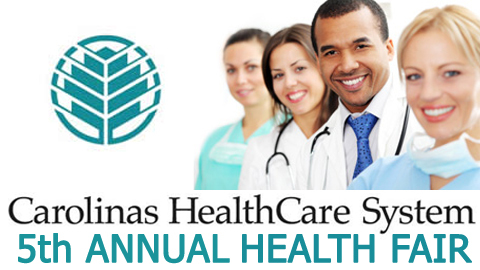 In all, Wednesday’s event raised $14,500 surpassing the total raised in 2012. 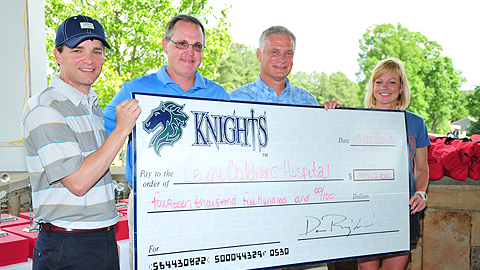 In the six-year span that the Knights have held the tournament, the team has raised over $100,000 for Levine Children’s Hospital. The Knights would like to take a moment to thank all of the great people who helped make Wednesday’s golf classic a success. We look forward to continuing our great relationship with the fine people at Levine Children’s Hospital and we can’t wait to raise even more money in 2014. ST. PETERSBURG, FL – The Class-A Short-Season New York-Penn League and its member clubs are proud to announce that the league’s philanthropic arm, the NYPL Charitable Foundation, will once again award over $10,000 in scholarships this summer to deserving high school graduates from the league’s 14 markets. High school seniors interested in entering the 2013 Scholarship Contest can obtain the official application from the Jamestown Jammers front office located at Diethrick Park, by clicking here or by visiting the league’s official website, New York-Penn League.com. The deadline to submit applications to the Jammers front office is June 28, 2013. Each club’s winner, including the three $2,500 scholarship recipients, will be selected in late July and honored at a game in August. This article originally appeared on the official website of the Jamestown Jammers. Click here to view the original story. 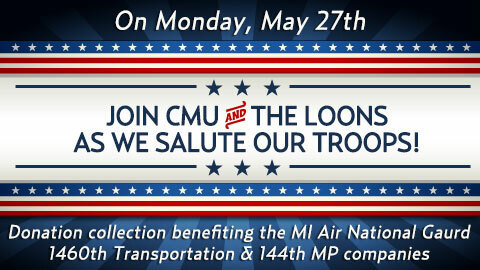 MIDLAND, Mich. – As part of their Memorial Day Celebration, presented by Central Michigan University, on Monday, May 27, the Great Lakes Loons and CMU will be partnering to collect items that are needed by members of the United States military. The State College Spikes and the New York-Penn League are proud to announce that the league’s philanthropic arm, the NYPL Charitable Foundation, will once again award over $10,000 in scholarships this summer to deserving high school graduates from the league’s 14 markets, including Central PA.
Now in its fifth year, the 2013 NYPL Scholarship Contest is open to any graduating senior from a public or private high school within the league’s footprint. Any student who has been accepted at a two or four-year college or university, vocational school, or technical education institution is eligible. Applicants will be judged based on academic performance, volunteer and extracurricular activities, and the impact that the Spikes and Minor League Baseball have had on their lives. The scholarship contest will consist of two stages – a local round and a divisional round. In the local stage, students will apply directly to the Spikes, with one applicant chosen to advance to the divisional round to represent State College. The Spikes’ nominee will then compete against representatives from the Auburn Doubledays, Batavia Muckdogs, Jamestown Jammers, Mahoning Valley Scrappers and Williamsport Crosscutters for the Pinckney Division’s $2,500 top prize. Any finalist who does not win the divisional prize will receive a $250 book award. High school seniors interested in entering the 2013 Scholarship Contest can obtain the official application from the Spikes online at State College Spikes.com or in person at Medlar Field at Lubrano Park. Interested seniors may also visit the league’s official website, New York-Penn League.com. The deadline to submit applications to the Spikes is June 28, 2013. The Spikes’ representative will be selected in late July and honored at Medlar Field at Lubrano Park during a Spikes home game in August. 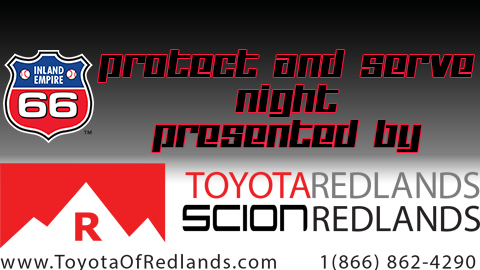 San Bernardino, CA – The Inland Empire 66ers have partnered with the San Bernardino County Sheriff-Coroner’s Department and local police departments for a special Protect and Serve Night, presented by Toyota and Scion of Redlands, honoring the brave men and women of local law enforcement. Proceeds from ticket sales for the game and bids from the silent auction of team jerseys will benefit the MacKay and Collins families, both affected during the recent Big Bear manhunt. Twenty percent of all ticket revenue will be donated to the families of fallen officer Detective Jeremiah MacKay as well as his seriously wounded partner, Deputy Alex Collins. In addition, sheriff’s-inspired jerseys worn by the team and coaches for the night will be auctioned after the game to benefit the families as well. ICA Broadcasting has seeded a drive for families affected by the severe weather in Oklahoma (Moore, Oklahoma City area), with a donation of $150,000 and are asking local residents to contribute as well. Cash donations (or check) will go to the Red Cross efforts in the area. CBS 7, KISSFM, My Country 96.1, Mix 106, Classic Rock 102 and News Talk 550 are all under ICA’s umbrella and are helping with the drive. Due to a lack of a Midland location, the Midland RockHounds and SockersFC have stepped up and will be accepting donations in Midland at the Citibank Ballpark Box Office. Donations will be accepted from noon until 7:00 PM at the ballpark and from noon until 7:00 PM in Odessa at the Music City Mall Parking Lot. Anyone that donates at Citibank Ballpark will receive a ticket voucher to a future RockHounds home game. – Donate online by going to www.redcross.org and click on the DONATE NOW button on the home page. – Text REDCROSS to 90999 to make a $10.00 contribution that will be added to the donor’s cell phone bill. – Credit card gifts can be made by phone by calling 1-800-Red Cross and/or calling the local office at 432-563-2267. – Checks may be mailed to P.O. Box 60310, Midland, Texas 79711 or dropped off at 9601 Wright Drive (Just East of the Commemorative Air Force Museum). Write Disaster Relief or Spring Tornadoes in the Memo Line of the check. OMAHA, Neb. 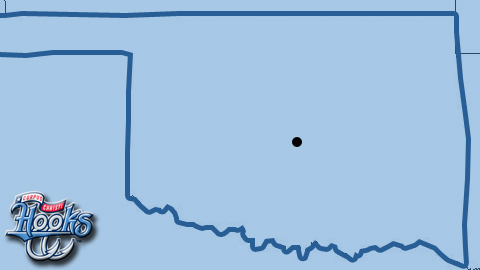 – The tragic events in Moore, Oklahoma over the past few days have hit close to home with the Omaha Storm Chasers, not only because of the storm and tornado history associated with the state of Nebraska and the Omaha Metro but also due to the Pacific Coast League membership of the Oklahoma City RedHawks, whose home park is located just fifteen minutes away from the city of Moore. Also during the remainder of the homestand, the Omaha Storm Chasers will be informing fans in attendance of the ways they can get involved in the relief efforts without bidding on the merchandise. Fans can Text REDCROSS to 90999 to give $10 to American Red Cross Disaster Relief, which helps people affected by disasters such as the recent tornadoes in Oklahoma. All money that is raised will be donated through the Home Run Foundation of Greater Omaha to the American Red Cross. The final amount will be presented in a ceremony when the Storm Chasers visit the Oklahoma City RedHawks for their series beginning a week from today on May 28. 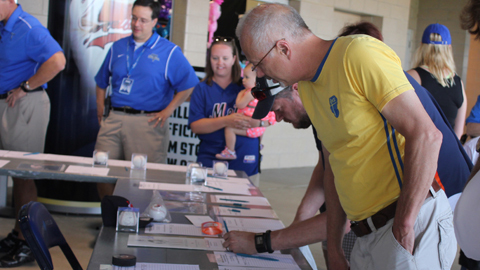 The Storm Chasers players and front office are exploring additional ways to help the affected area of Moore.